A leading US manufacturer of body cooling and hot & cold therapy products since 1984. How do I choose which cooling is best for me? For acute injury and pain, the standard of care is the R.I.C.E. method: Rest, Ice, Compression, and Elevation. 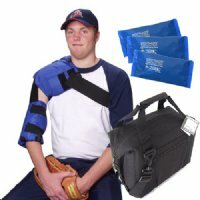 Soft Ice® Compression Wraps provide both cold (ice) therapy and compression therapy to help with pain relief and promote recovery for soft tissue injuries. Cold compression aids in reducing swelling, bleeding, spasms, and pain. Apply as soon as possible after an injury has occurred and continue for 48 to 72 hours. Heat or Moist Heat Therapy should be used for chronic conditions such as muscle discomfort, stiffness, arthritis, and other chronic conditions. Applying heat to an area effectively opens up the blood vessels allowing blood to flow freely to the affected area. This increases circulation, delivering an increased supply of oxygen and nutrients and removing waste from sore, fatigued, and injured muscles. Many doctors recommend alternating cold and moist heat therapy for chronic pain as well - 20 minutes of cold, 20 minutes off, and then 20 minutes of moist heat. Combination therapy is an effective treatment for repetitive strain injuries, and can help with the pain of arthritis. For acute pain, once the swelling goes down, alternate cold therapy and moist heat therapy as described above. 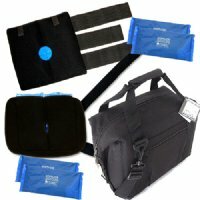 Our Drug-Free Pain Relief Kits provide the synergistic therapeutic benefits of cold compression and moist heat. We are here to answer your questions! Send us a message and we will get right back to you. To speak with Customer Service, please call us at 1.800.763.8423. You must complete the Required fields. Thank you for contacting us! We will reply promptly.